The Washington Wizards were riding a pretty impressive four-game winning streak headed into their home matchup against the Los Angeles Clippers. However, any momentum they had built up over that win streak was quickly stopped by the team of old friend Paul Pierce. The Clippers dominated from beginning to end, winning 108-91. The Clippers outclassed the Wizards from the opening tip, mostly with the stellar play of L.A.’s 2-guards, Chris Paul and Jamal Crawford. Paul finished with 23 points and seven assists, while Crawford finished with 21 points on 9-of-12 shooting. John Wall seemed to be the only one on the court that was on his game, matching Paul’s 23 points and adding 11 assists. Otto Porter added a good shooting night, hitting 8 of 12 shots on the way to 21 points. Marcin Gortat scored 12 points with 16 rebounds. Gortat was named Eastern Conference Player of the Week, leading the Wizards to a perfect 3-0 last week for his first-ever Player of the Week honor. The Polish Hammer put up 21.3 points, 11.7 rebounds, and 1.7 blocks per game while shooting a blistering 59.6 percent from the field. 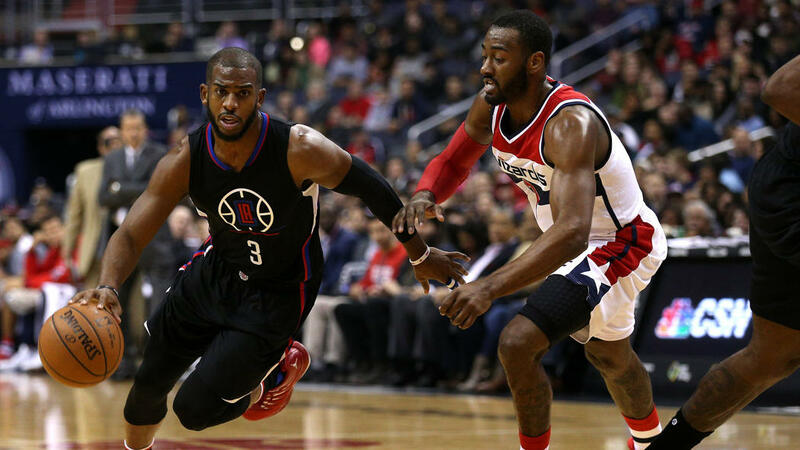 Chris Paul scored 30 points with 15 assists and the Los Angeles Clippers proved too much for the Washington Wizards in a 113-99 win Friday night at the Staples Center. The loss puts a halt to the Wizards’ five-game winning streak. John Wall paced the Wizards (40-29) with 19 points, 10 assists and six rebounds. Bradley Beal added 18 points on 5 of 10 shooting, including three 3-pointers. Paul Pierce was 2 0f 11 for six points, missing eight in a row at one stretch. J.J. Reddick had 26 points, including four 3-pointers, for the Clippers. Blake Griffin had 22 points while DeAndre Jordan added 10 points and 23 rebounds. Washington got down early and stayed there. They led 5-3, but Reddick nailed a pair of 3-pointers which started a 15-4 Clippers run to take the starch out of the Wiz’ start. The Wizards played even with the Clippers the rest of the way (33-31 in the 2nd quarter, 23-24 in the third and 22-23 in the fourth), they were never able to make a run and really get back into this one. Washington plays at Sacramento on Sunday at 6:00 pm Eastern in the third of a four-game west coast swing. Back in the friendly confines of the Verizon Center on Friday night, the Washington Wizards defeated the Los Angeles Clippers 104-96. The Washington Wizards (8-30) had a prime opportunity to tally a win against yet another unlikely victim this season, but their fourth-quarter rally proved too little too late as the Los Angeles Clippers (32-9) held on to win it, 94-87. For starters, neither Blake Griffin nor Chris Paul played to their full potential Saturday night at the Staples Center. Griffin went 5-for-18 with free throws accounting for seven of his 17 points on the night. Paul tallied 22 points in his return after missing three games with a bruised right patella, but he still managed to go just 6-for-16. While Griffin and Paul were sub-par on offense, they delivered when it mattered most and stole key opportunities from the Wizards in the final minutes of the game. Less than two weeks ago the Washington Wizards were embarrassed by the Los Angeles Clippers 107-81 at the Verizon Center, losing to a team that had just flown cross country to start a six game road swing. In their first game back at the Staples Center, the Clippers were able to fight off a considerably feistier Wizards squad, eventually pulling away for a 102-84 win. John Wall had 18 points, 11 assists and 6 rebounds, and JaVale McGee had 18 points but only five rebounds for the Wizards, who snapped their first win streak of the season. Butler started off hot against his former team, scoring 11 points on perfect shooting in the first quarter. But Wall hit an outside jumper early on that allowed him to be effective both driving and passing, notching four points and four assists in the game’s first nine minutes. Along with improved interior defense by Trevor Booker and JaVale McGee, the Wizards were able to avoid the slow starts that have doomed them against good teams in the past, staying within a score for most of the first quarter. Despite celebrating their homecoming the Clippers played carelessly throughout the first half—something unexpected from a team lead by a consummate PG in Paul. Back-to-back traveling violations early in the second quarter gave the team five in 14 game minutes and allowed the Wizards to take a 27-25 lead with 8:47 remaining in the half. While both squads played sloppily at times, they were also both active defensively. They combined for numerous spectacular rejections—several of which did not factor in to the teams’ six first half blocks due to fouls. The teams also combined for 10 turnovers—despite neither team recording a steal. Nick Young cooled significantly from his hot night in Portland, where he hit 7-8 three pointers on his way to 35 points Tuesday night. He was held to one point one 0-for-6 shooting in a sluggish first half in his hometown. McGee paced the Wizards with 13 points on 6-for-7 shooting, many coming on powerful dunks. Jordan Crawford added 12 and hit two of his three attempts from three point range. The Clippers were able to take a 50-47 lead into the half, due in part to their 17 second chance points on nine offensive rebounds. The second half saw continued defensive intensity by both teams. While Griffin ran roughshod on Washington’s big men in their last meeting, Booker made him work for every inch on the block this time around. The constant contact frustrated the Clippers big man, culminating in several heated conversations with the referees. Washington fell behind by seven on a botched play four minutes into the third quarter, when a near turnover by Paul turnover became a wide open three pointer for Caron Butler that made it 56-49. Just as the Clippers looked poised to pull away, the Wizards went on an 11-2 run. Young hit two three pointers over that stretch, the second of which gave the Wizards the lead. Booker was forced out of the game with his fourth foul toward the end of the Washington run, and rookie Jan Vesely was forced into duty guarding Griffin. He was out-muscled on several consecutive possessions, giving up four points and accruing two quick fouls that sent him to the bench and brought Rashard Lewis into action. With an extra shooter on the floor, Young was able to free up for an open three that tied the score at 66. From there the Wizards went cold, coming away empty on eight straight possessions to end the third and giving the Clippers a 74-66 lead. With Booker and McGee on the bench to start the fourth the Wiz made two quick baskets, and Wall’s second long jumper of the game brought them to within 75-72 with 10:12 to play. A three pointer by ex-Wizard Randy Foye gave the Clippers some breathing room, and his two free throws on the next possession extended the lead back to eight. The Wizards could never quite get over the hump from there. After two Wall free throws cut into the lead, the Wizards turned the ball over with a chance to trim the deficit to four. Instead the Clippers got a three pointer late in the shot clock on the ensuing possession for their biggest lead of the game, 83-74. Another Foye three pointer gave him 10 fourth quarter points and increased the Clippers lead 88-76 with 6:56 left. Despite several opportunities to erase the advantage, the Wizards were repeatedly whistled for infractions—including a lane violation on a missed Griffin free throw when the game was slipping out of reach. The team was clearly feeling the effects of a back-to-back, allowing the Clippers to win going away in a game that was hotly contested for all but the final eight minutes. The Wizards continue their 5 game road swing Friday in Salt Lake City before finishing Monday night in Phoenix. WASHINGTON, D.C. – There was a time when the Los Angeles Clippers were the epitome of haplessness. With the addition of Chris Paul in the offseason and emerging superstar Blake Griffin on the same squad, whenever the Clippers play – it’s a must see event. 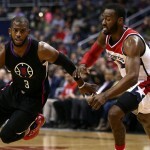 However, the Washington Wizards are stuck in the same rut as the Clippers had been for countless years. They are a work in progress with mixmatched parts, and on Saturday night it was startling to see the difference between the two squads.